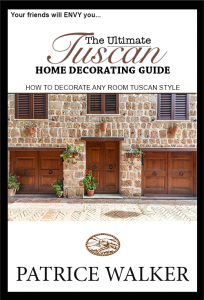 There are a few quick Tuscan Decorating ideas that can make standard kitchens turn into lavish Tuscan kitchens. I have especially decided to write this page because of the emails that I receive expressing the concern that money is a dilemma. People want to have beautiful new homes, but with the economy presently the way that it is, homeowners are realizing that this makes things a little bit harder to achieve. 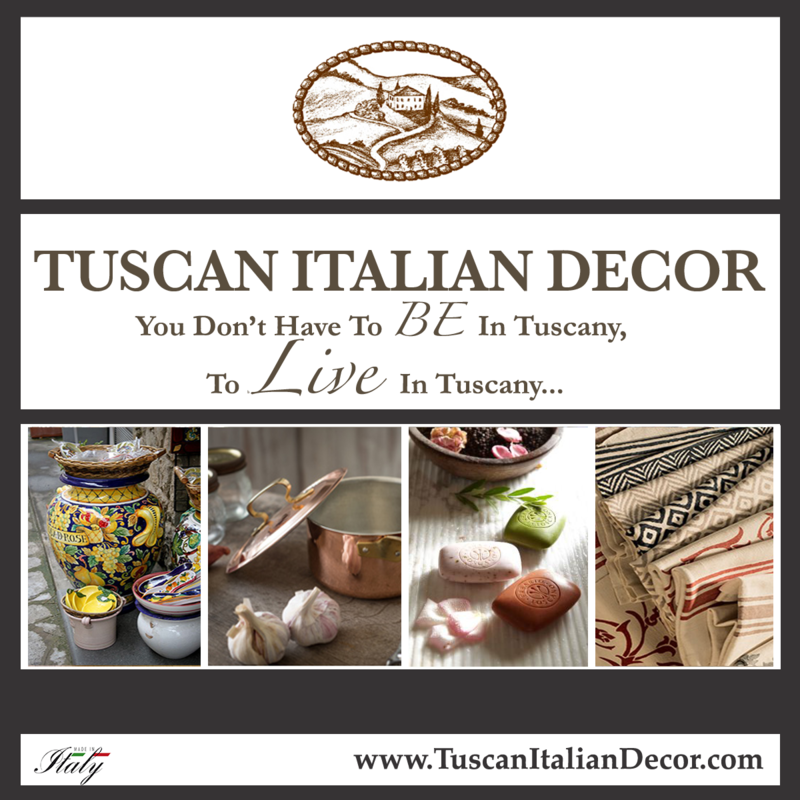 So, here are some extra special Tuscan decor ideas and tips that can make your kitchen feel like a new Tuscan retreat. 1. Wall color: Your wall color can set the tone for your kitchen. How about applying a muted brown hue on the walls with a texture technique to give an aged appearance. Click here for a great website that teaches how to faux finish. This website specializes in teaching DIY (Do It Yourself) faux finishing. 2. 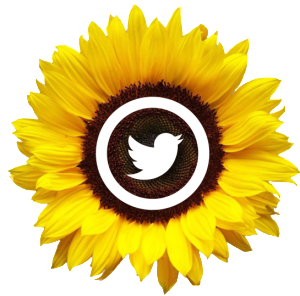 Island: If you have the space, for an inexpensive price, consider a free standing old wooden center island or table. An old wooden farmhouse table would be perfect. Something that is darker in shade; nothing too overpowering in your kitchen. One that will continue to provide ample space to move around in, even something that may have open shelving underneath would be ideal. You can purchase tables in Tuscan furniture stores, or you may even find one at a yard sale or thrift shop. Save a few bucks! 3. Accessories: Look for old Italian ceramics and antique crocks. With these pieces displayed openly in the kitchen, you will accomplish the Old World attitude you want. You can also consider a small art like a painting or Tuscan photo to be displayed in the kitchen. A special addition that I love recommending is a beautiful bouquet of sunflowers. This can work with either freshly cut, or faux. After the wall color and texture is applied, you will immediately notice a new vibe of Tuscany. Place your dark stained wooden table or island in the center of your cooking area. 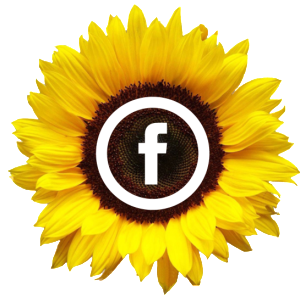 A nice Tuscan urn to hold your sunflowers on top of your island adds the sunny side of Tuscany. With the antique Tuscan accessories, display them scattered on the counter tops, underneath the island (if available), on open shelving of cabinetry (if available), and for larger urns, place in corners of the space.The beauty of Tuscan decor is that things do not have to be “clean cut”. 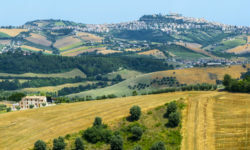 There is no particular way at all that you have to organize your Tuscany attributes. In a Tuscan style kitchen the cabinetry and pieces are mismatched. That is what makes the design so comforting and cozy. 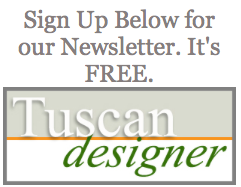 Join our free Tuscan Designer Email Newsletter for more quick tips to turn your home into a Tuscan retreat! 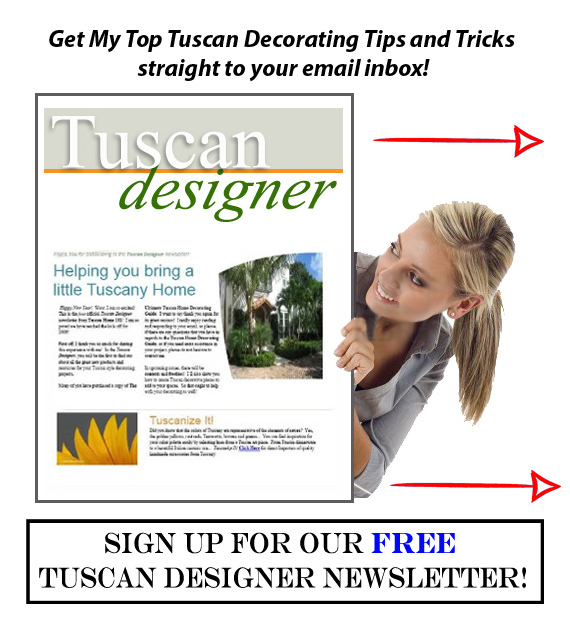 Free up to date tips and techniques delivered especially to you on a monthly basis to assist in all your Tuscan decor needs.